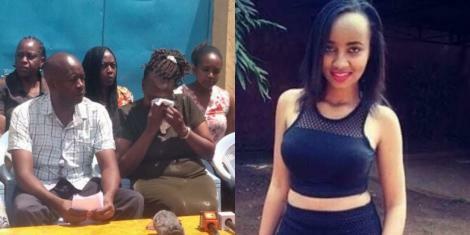 Monday April 15, 2019-Slain medical student Ivy Wangechi' mother, Winfred Waithera, has lashed out at bloggers for tarnishing her daughter’s image even as she comes to terms with the death of her first born child. Speaking to the press on Sunday at their Thika home, Waithera appealed to bloggers to stop peddling lies and propaganda on social media about Wangechi. “I want to make it clear that the Ivy the bloggers are talking about and trying to portray in a bad light in social media is not the same one we knew. The Ivy we knew was God-fearing, disciplined and one who did not depend on or have sponsors,” she stated. Waithera lamented that Wangechi’s death hit them hard and reports portraying her in bad light only added insult to injury. “We are still in shock and cannot believe that Ivy is gone forever. It is so hard to imagine that we will never see her again. It is so painful for us as parents and family,” she added.